Sometimes. Just sometimes, I hit the ball out of the park. And friends, I hit the ball out of the park when I make bruschetta. Instructions below. Dice tomatoes and combine with garlic, olive oil, vinegar, and salt. Toss together and set aside. Slice bread in 1/2″ thick slices. Using pastry brush, brush each slice of bread with olive oil. Brush both sides. 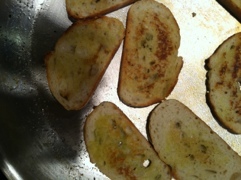 In largest fry pan, toast bread slices over medium heat (with additional olive oil in pan, just enough to cover surface). 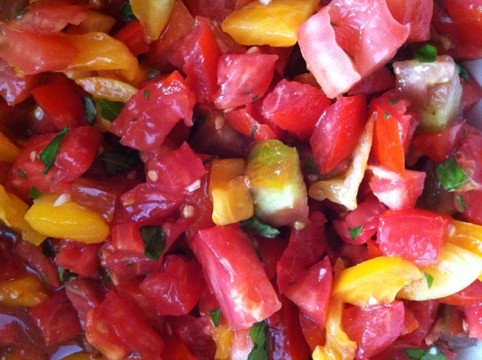 When pieces are adequately browned, top with bruschetta tomato mixture and serve immediately.